Koontz’s first job after graduating from Shippensburg State College in Pennsylvania was in the Appalachian Poverty Program, where he was expected to counsel and tutor underprivileged children on a one-to-one basis. 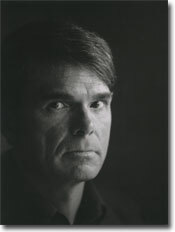 The following year was filled with challenge and also tension, and Koontz was more highly motivated than ever to build a career as a writer. He wrote nights and weekends, which he continued to do after leaving the poverty program and going to work as an English teacher in a suburban school district outside of Harrisburg. After he had been a year and a half in that position, his wife, Gerda, made him an offer he couldn’t refuse: “I’ll support you for five years,” she said, “and if you can’t make it as a writer in that time, you’ll never make it.” By the end of those five years, Gerda had quit her job to run the business-end of her husband’s writing career. Dean and Gerda Koontz live in southern California with their golden retriever, Anna, and with the enduring spirit of their golden, Trixie.